“Good morrow, Steward Firebeard. How fare you today?” I asked. “I was planning to work at the enchanting table. However, on the way over, I ran into a strange man on the streets who asked me to find his master in the Pelagius wing of the palace. Do you know anything of this?” I inquired. “Wait, I can go in there and investigate,” I offered quickly. I was curious to see the Pelagius wing, and I didn’t want to miss my chance. “Most likely there is nothing going on. If someone did get into the Pelagius wing without your knowledge, though, then it would be a security breech. It is best to follow up, just to be sure,” I persuaded. I headed straight for the door and walked in. It had the mustiness and dampness of a long abandoned cellar. Cobwebs and spiderwebs covered nearly every inch of space. I could find no signs of life, though. If spiders made these webs, they abandoned them long ago. I shivered involuntarily. What was wrong with this place that even spiders shall not dwell? As I walked down a carpeted hallway, I soon found out. My vision faded. I clutched my head as I was brought to my knees. A sudden flash of blinding white light forced me to cover my eyes. I was no longer in the Blue Palace. I wasn’t quite sure where I was. I wondered if was another scrying attempt by my brother. I missed speaking with him. 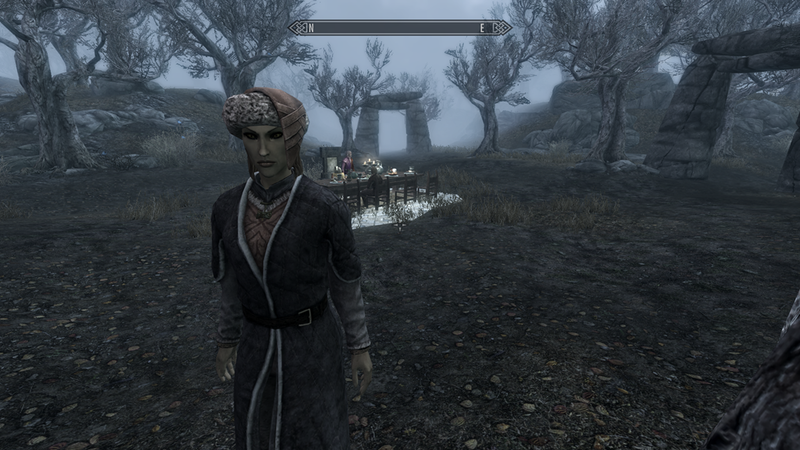 While Lydia was a good companion and my best friend in Skyrim, our conversations were of the populist sort. A warrior by trade and heart, she did not delve deeply into the intellectual and cultural interests. I missed philosophical debates with my brother. Once I got my wits about me, I heard a ‘debate’ of another sort. Except it was a debate that only the insane could make sense of. I discovered to my surprise that my clothes had changed, and I was wearing a ridiculous hat. It appeared two men were having a dinner party. I walked over to them. One of them disappeared as I approached. The other stood to greet me. He said he had come to visit with an old friend, Pelagius the Mad. Clearly, I was the one who was mad. Reality? Sanity? How does one know if one is sane? I pinched myself. Yep, it hurt. And it proved nothing. The man before me introduced himself as Sheogorath. I should have listened to Falk Firebeard. I was in the playground of the most unpredictable daedric lord of oblivion. Whatever he had in mind for ‘amusement’, I had no choice but to go along with. He said he had a little game for me. I was going to “fix” Pelagius’ mind. He gave me a staff called “The Wabbajack”. 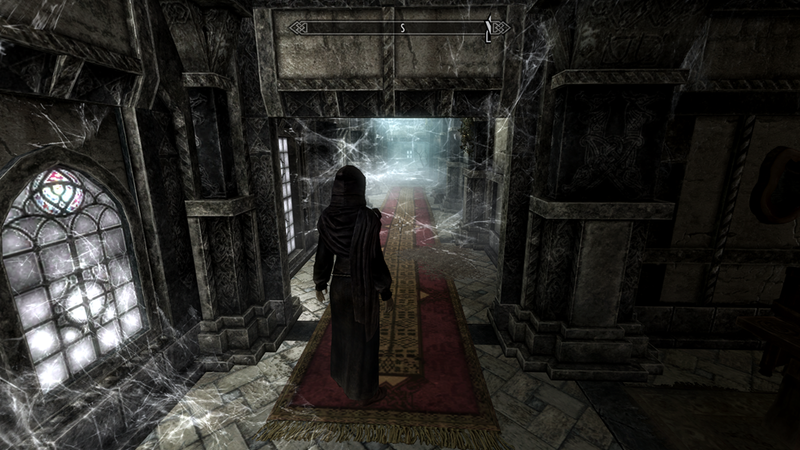 I walked through various portals which were supposed to represent different aspects of Pelagius’ psyche. He had insecurity issues. He had control issues with his mother. Hah! It seemed we had something in common. He was besieged by night terrors. I thought unnervingly of my first nightmare after escaping Helgen. Sheogorath was pleased with his little game. I was pleased that he seemed to be in a good mood. He was the most unstable of the daedric lords, and this venture into the strange was getting off easy. There was nothing that presented an eminent danger. I considered myself lucky. With that, he summoned his servant back to him and said he was going home. He gave me the Wabbajack as a parting gift. I didn’t really want it, but I didn’t want to risk upsetting his good mood. I thanked him for his generous gift, and wished him safe travels back to oblivion. Where I hoped he would stay for a long, long time. I put the Wabbajack safely into my pack. When I eventually purchased a home, I planned to store it somewhere safe. An utterly unpredictable staff that can turn dragon priests to goats, or goats into giants, it was something best locked away. I returned to Falk Firebeard and told him the wing was clear. 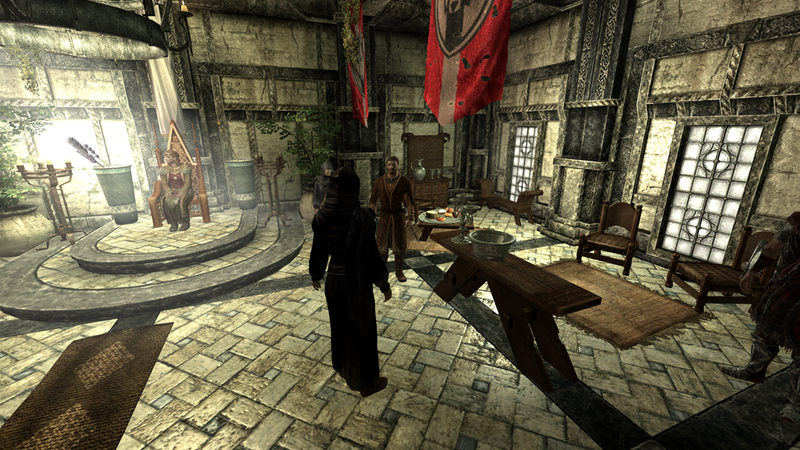 I did not tell him that the daedric lord of madness was hosting dinner parties with dead emperors. I said the man on the street was insane, but there was nothing of danger to worry about. I headed for the enchanting table where I spent the next several hours studying magical items for their effects. Lydia wondered why I always took the seemingly worthless iron daggers as prizes over the more expensive war axes and hammers. I asked her if she would like to carry them. She said no. I applied several absorb health enchantments with petty soul gems onto iron daggers. These netted me approximately 200 septims each trading with the merchants. Worth far more than the heavy war axes, and I could carry more of them. Being overburdened in a combat situation wearing nothing more than a cloth robe is a foolish way to meet the gods.